paperandtape: Scrap the Boys - Feb challenge. Scrap the Boys - Feb challenge. Wow time has got away once again. I didn't realise it had been so long since I had entered a challenge! This year with number 3 at kinder and 1 & 2 at school I am hoping to get a bit more scrapping done while number 4 is sleeping! 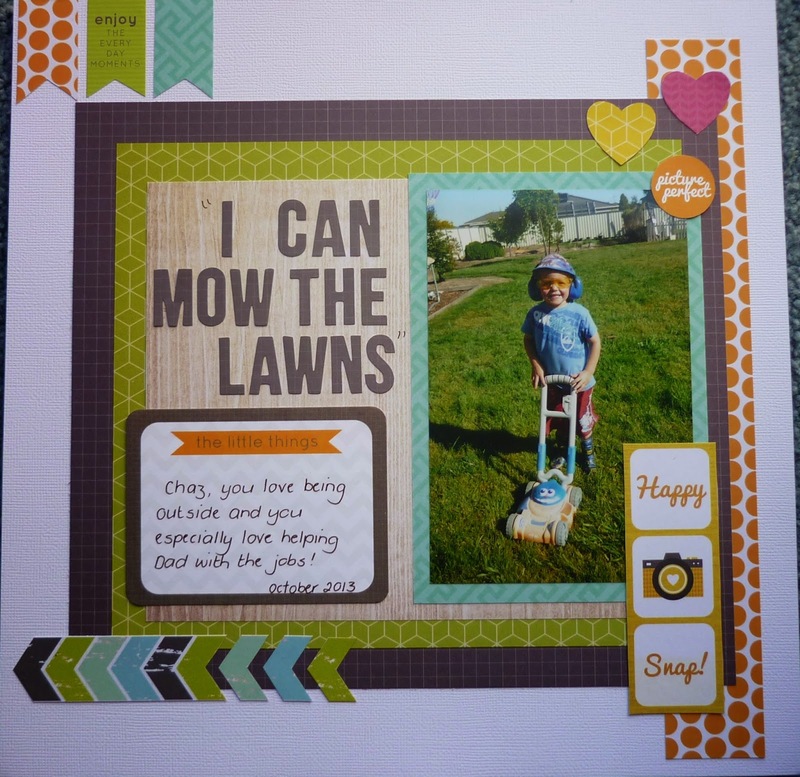 This month I have entered the challenge over at Scrap the Boys. It was all about scrapping something your boy has said! Number 3 - Chaz just loves to help his Dad outside so this photo of him "helping" to mow the lawns was perfect. After dabbling with a bit of mixed media and new techniques I returned to my "clean & simple" style and I'm happy with the result. This is so cute. What an awesome layout. Sometimes clean n simple is my fav too! Fabulous page! Sounds like you have your hands full with your kids, glad you got time to join in with STB. Fantastic take on the challenge, love the layers of colour. Thanks for playing along with us at Scrap the boys. Great pic and take on the challenge! !....I love your colour combo. Thanks for joining us at STB. Enjoy the time in your studio..
A great page! Love his enthusiasm!! !